"This is the best Yoga Nidra CD I have come across and I use it on my retreats. If you are looking for a good yoga nidra CD and to enjoy the health benefits of deep relaxation then I thoroughly recommend this. Rebecca has a lovely voice." 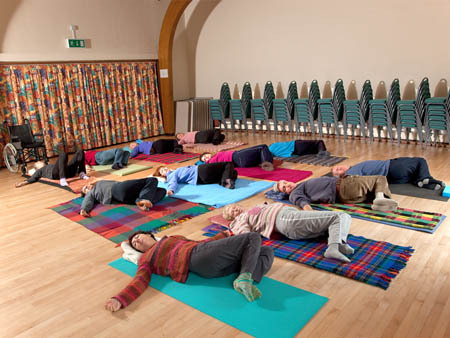 Sheffield Yoga for ME/CFS runs specialised yoga classes for people with ME and Chronic Fatigue Syndrome in Sheffield. Printer cartridges, mobile phones or used stamps. The inclusion of information on this website does not imply a recommendation or guarantee of accuracy. Individual opinions do not necessarily reflect those of the whole group. Sheffield Yoga for ME/CFS is not responsible for the content of external links. Before embarking on anything new you are advised to discuss this first with your practitioner or doctor.